Fake news, much like the golden deer in the Ramayana, is leading the world into chaos, says Arundhuti Dasgupta. 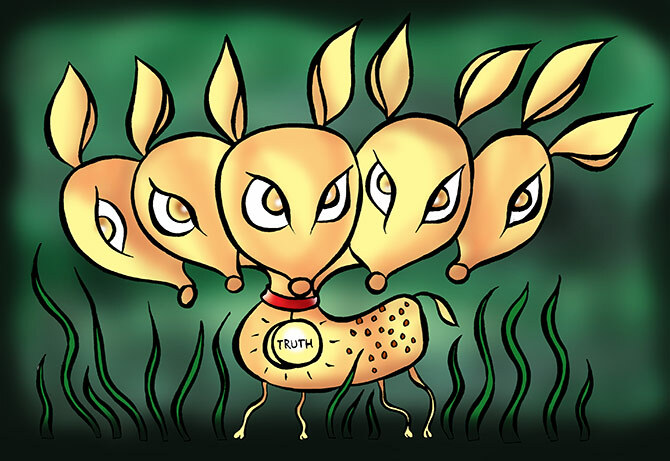 The real is finally mythical; and fake news, much like the golden deer in the Ramayana, is leading the world from order into chaos. Fake news is real, morphed images are used freely to make a point, quotes are repurposed to state what they never did or to make a point different from the original one. The golden deer was a demon in deerskin and it presents a turning point in the epic. It led to Sita's abduction and the subsequent battle between Rama and Ravana, and changed the course of the narrative -- just as misinformation, white lies, hyperbole and outright lies are doing today. There are two parts to the problem of credibility today: One is the dwindling trust in people who wield power and the second is the lack of faith in the words they use. For instance, when politicians talk about the demonetisation exercise or growth or religion, the words used are the same but intent and understanding differ. Words have lost their power, being used to make a point rather than reveal a truth. In myths, the word is sacred. It is the beginning of the world and brings the universe into being. If the word is divine, she must be upheld and hence myths were fashioned around principles that aimed to drive home the importance of being true to a promise or a curse or a boon. In the Ramayana, for instance, there are stories that set down the dire consequences that may result if the word of Brahma, the creator god, is proven false. Brahma had granted Ravana the boon of immortality. Drunk on his power, the king of Lanka stormed into the realm of Death. Brahma had also granted Yama the kaldanda, the weapon that gave him authority over the end of every creature's life. So when Ravana faced off with Yama, Brahma was rattled. If Yama killed Ravana using Brahma's weapon, his boon would be rendered false. And if Ravana survived, then his word to Yama would be untrue. So Brahma asked Yama to stand down because he said that making his word false would put all the three worlds at risk. Truth was more important than anything else. Brahma's veracity has to be absolute if the universe has to keep its consistency, wrote Robert Antoine, a Belgian Jesuit priest who taught comparative literature at Jadavpur University (Rama and the Bards: Epic Memory in the Ramayana). Brahma's word stands for universal truth, and when that is challenged or rendered futile by misuse, the world falls into an abyss. The Greek myths add another layer to the power of truth in the story of Aletheia's origin. Prometheus sat down to sculpt the perfect goddess, one who would regulate human behaviour. He was nearly done with his work when he was called away by Zeus. Prometheus left the workshop under the charge of his assistant, Dolus (trickery), who fashioned an identical sculpture. But just as he was about to put the feet on the sculpture, Prometheus walked back in. The god did not question his assistant for he wanted to take credit for the work and he breathed life into both. But, Truth, or Aletheia, walked with measured steps, while the other stood in her tracks. Her name is Mendacium, or Falsehood. A lie wrecked the order of the universe and had to be stopped, that is what the myths said. In the Mahabharata it was seen as the greatest sin. Yudhishthira suffered a glimpse of hell because he told a half-truth on the battlefield, not because he gambled away his brothers and wife. In epics and myths across the world, sages took their students to task for not revealing the most inane details of an exercise and kings staked their children to keep their word. Truth was non-negotiable, unlike the present day when it stands in front of a mirror with many faces.